Drone image above courtesy of Brampton Fire & Emergency Services. On Friday, March 15, approximately 85 homes in Bolton, Ontario were affected due to flooding in the vicinity of King Street East at Humberlea Road. The flooding was caused by an ice jam upstream of King Street East and Old King Road in Bolton, in addition to rain and snowmelt from warm temperatures. Over the last two weeks Toronto and Region Conservation Authority (TRCA) issued numerous flood forecasting and warning messages. TRCA regularly visits areas susceptible to ice jams as part of its River Watch monitoring program, and had visited this site earlier in the day on March 15. Learn more about TRCA Flood Risk Management. Around 7:00 pm on March 15, upon learning of the flooding, TRCA took action by sending staff to the site, as well as reporting the flooding to the local Community Emergency Management Coordinator (CEMC). From 9:40 pm on Friday March 15 until 7:00 pm on Saturday March 16, TRCA staff were on site to provide assistance to the Town of Caledon emergency contractor and Caledon Fire and Emergency Services. Crews and emergency personnel worked throughout the weekend to clear ice jams along the Humber River and help residents access their properties. King Street in Bolton has now reopened, and most residents have returned to their homes. Peel Region continues to provide support for residents who may need housing or other services. TRCA is advising the public to exercise extreme caution around all bodies of water, including the Lake Ontario shoreline, and to avoid driving through ponded water. Stay aware of messages from your local municipality, and follow the direction of first responders. TRCA continues to monitor the situation closely and will update the public accordingly. We will also continue to maintain active conversations with our municipal and provincial partners. Image captured by TRCA staff on Monday March 18 shows water is now in the channel (taken at 9:30 am). 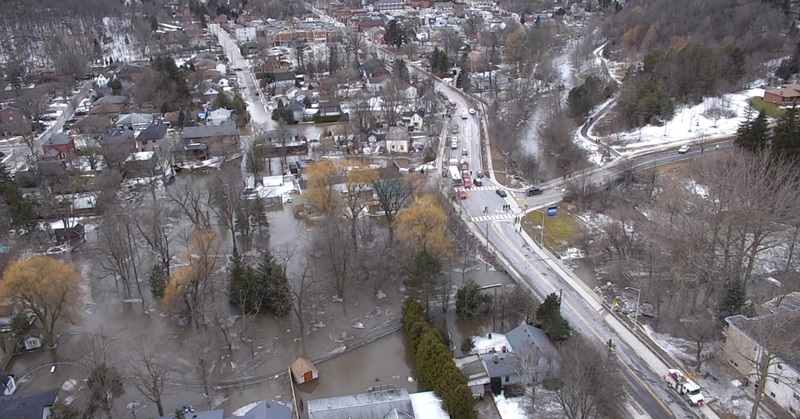 Additional information on this flood event, including updates on safety concerns and access to homes, can be found on the Town of Caledon website.